Rate this project A new version of KaOS, a rolling-release Linux distribution with KDE Plasma as the preferred desktop environment, has been released. 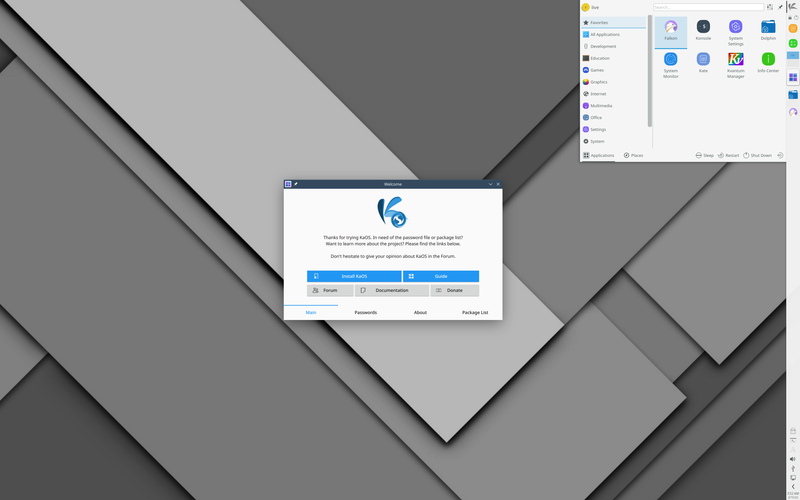 Version 2018.12 comes with the very latest that the KDE and Qt projects have on offer, including Plasma 5.14.4, KDE Applications 18.12.0 and Qt 5.12.0: " KaOS is proud to announce the December release of a new stable ISO image. Two years after initially starting the move to OpenSSL 1.1 has this update become possible. All downstream libraries and applications have caught up, so the move was now smooth, without the need to have a mix of OpenSSL versions in the repositories. This move required a very large rebuild and combined with a move to Perl 5.28.1, FFmpeg 4.1, LLVM/Clang 7.0.1 and Qt 5.12.0, it is clear a new ISO was needed. The artwork saw an update to the Midna SDDM theme, gone are the QML sliding effects, instead a cleaner and simpler layout with the addition of several warnings when numlock or capslock are activated. Online Package Viewer has undergone a complete rewrite; the backend is now a very modern Go-based API, with JSON files getting the needed output, thus all loads much faster. This include the mirror status page." Read the detailed release announcement for further information. Download (SHA256): KaOS-2018.12-x86_64.iso (1,990MB, signature, pkglist).